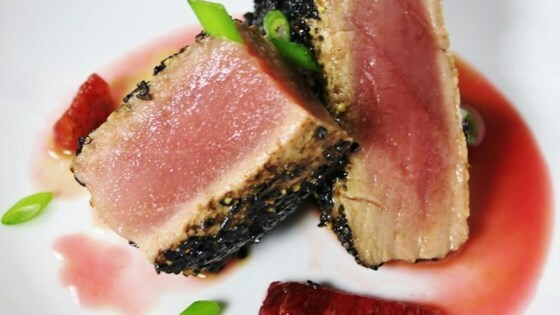 "A fast, healthy, inexpensive way to enjoy ahi tuna at home. Serve with almond green beans and wild rice for a healthy and delicious meal." In a skillet, heat olive oil over medium-high heat. Sear tuna on one side for about five minutes. Flip and sear other side for two to three minutes, or until tuna is cooked to your desired degree of doneness. Remove from skillet and allow to rest. Return skillet to heat and add white wine. Scrape the bottom of the skillet with a wooden spoon and simmer until wine is reduced by half. Reduce heat to medium and butter, shallot and garlic; cook and stir until shallot is clear, approximately 3 to 5 minutes. Stir in blood orange juice. Boil until the liquid has reduced to half its original volume or until it thickens. Remove from heat. Slice the tuna across the grain. Fan the slices out onto a place and drizzle with blood orange sauce. This was wonderful! Our family had never tried Ahi Tuna, so this was a great 1st taste. I didn't have a blood orange so I used mango puree...tasty!